The entire process for your new Pull-Out shelves is completed in two easy steps. Our trained professionals will visit your home, take inventory of your cabinetry and storage, and give you a recommendation tailored exclusively for you. Once your needs are made known to us, we will take some measurements, determine what shelves are best suited for you, and give you an on-site estimate. We will then place your order for each custom-made shelf. Building and delivery of your Pull-Out shelves will take two to three weeks. Our installers will then return for your on-site installation. Because we use your existing cabinetry and dimensions and do some pre-assembly work at our plant site, most installations will be completed in a few hours. 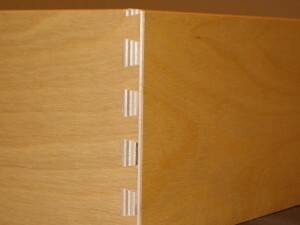 All Pull-Out shelves are hand-made and assembled utilizing durable dovetail construction. Each shelf will hold 100 pounds when fully extended and is supported on each side by powder coated steel brackets. Using the pilaster support system, each shelf can be adjusted as your needs change. Adjustments to the shelf level can be easily made by the customer. Versatility – Shelves are fully adjustable to meet your ever changing needs, and can be installed in kitchen cabinets, pantries, bathrooms, workshops, or even entertainment centers. Based on your storage requirements, we offer handcrafted, custom shelves of various heights. All shelves are available in blonde (natural) or white finishes. 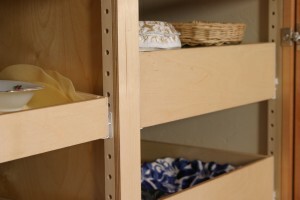 Accessibility – Cabinetry items and goods are right at your fingertips by simply sliding out your Pull Out Shelves. 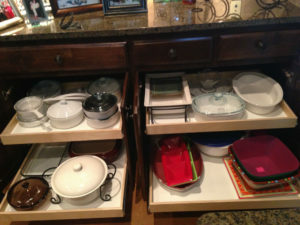 No more of those “must have” items lost or hidden in a back corner of your cabinets or pantry. Think of the user friendly environment of your bathroom and kitchen, especially with regard toward the physically challenged or senior citizens. Dependability – All shelves are designed to support 100 pounds when fully extended, and come with a lifetime warranty on the shelves and ball-bearing steel glides. Improved Organization – Pull Out shelves will eliminate the clutter, improve the visibility of all needed items, and give you peace of mind that comes with an organized kitchen, pantry or bath. Great Investment – Pull Out shelves not only enhance the appearance of your cabinetry, but they also add value to your home. The beauty and functionality of the shelves will not only make your life easier but will serve as a great selling point in the event you decide to put your home on the resell market.